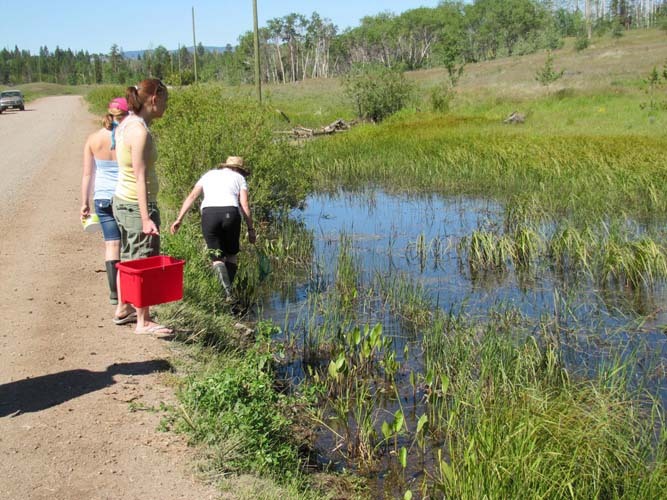 In the spring of 2011, the Nicola Naturalist Society in partnership with Biolinx Environmental Research Ltd. of Victoria, began an ambitious project to map and monitor breeding amphibians (frogs and salamanders) in the Merritt region. The Biolinx team, led by Dr. Kristiina Ovaska, has released the first progress report on this project. Nicola Naturalist Society volunteers frogging at Harrison Lake. Photo: Kristiina Ovaska. amphibians were mapped in 10×10 km grids – 30 grids were sampled in 2011. Seven major and two minor-breeding sites of the Western Toad were identified. These sites are exceedingly important to protect as they can attract hundreds or thousands of toads over a wide area. 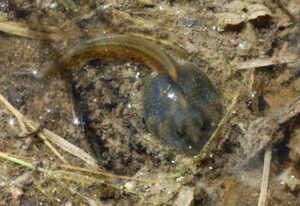 The Spadefoot and Pacific Chorus Frog were readily detected during night-time frog call surveys. This looks like a promising method to track population trends in future years. The data collected contribute to the provincial database through the B.C. FrogWatch. An important part of the project is liaison with local landowners. Biolinx prepared site-specific habitat management guidelines for three large landowners with amphibian habitat on their lands, including breeding sites for the Western Toad and Spadefoot. Contacts were established with the Nicola Tribal Association and are expected to lead to collaboration with local First Nations. Funding for the project was provided by the BC Habitat Conservation Trust Foundation and the BC Public Conservation Assistance Fund. The project will continue in 2012.